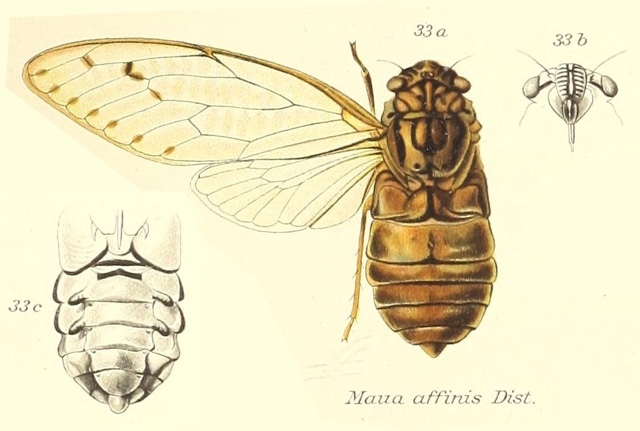 Maua affinis Distant, 1905, is a cicada found in Borneo (Brunei, Indonesia, Malaysia). Characters. — Head (including eyes) as wide as base of mesonotum and as long or a little longer than space between eyes; face prominent and elongately convex, not in a line with vertex; pronotum narrowed anteriorly, its lateral margins angulated or toothed; mesonotum much longer than pronotum; abdomen broad, its apex about or almost as broad as base, in male not or scarcely longer than space between apex of head and base of cruciform elevation, tubercles on the second and third ventral segments very large and prominent, opercula small; tympanal coverings in male sometimes as long as, sometimes shorter than, breadth at base; rostrum reaching, generally considerably passing, the posterior coxa; tegmina and wings hyaline.